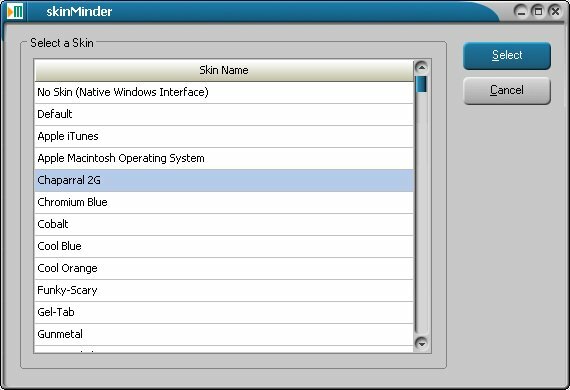 This page should be helpful to everyone who would like to get an idea of what TrainMinder’s screens will look like before purchasing the product. Our first consideration in designing each TrainMinder screen is ease of use. TrainMinder’s screens and buttons are all clearly marked and well labeled. 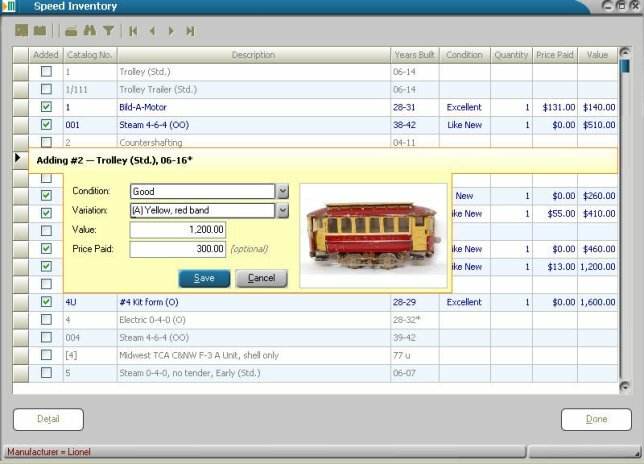 Users who know anything about toy trains should be able to look at TrainMinder’s screens and functions and “just go”. We have selected a representative set of screens that show key TrainMinder features and functions. We will add to this list over time, so please check back often to see what’s new. 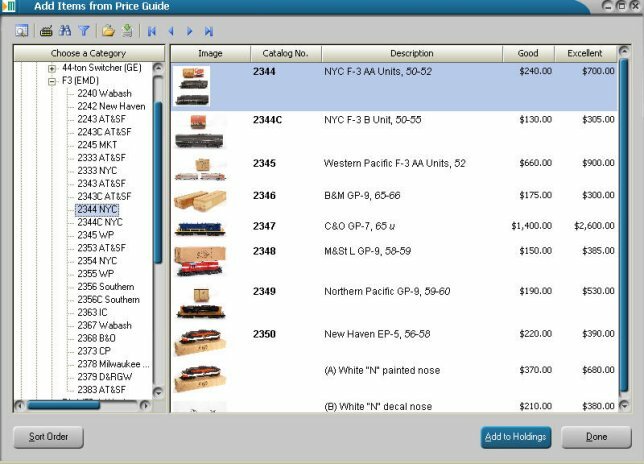 The TrainMinder Price Guide Browse screen is almost finished and features an intuitive, easy-to-use interface that will serve novice and experienced train collectors equally effectively. Trains may be selected from a straight listing of Catalog Nos. (for those experts who know their numbers...), or selected by category from a logically organized list. In addition, images from the new TrainMinder graphics library are displayed next to every piece — down to the individual variation level — to help confirm the piece you are entering. The example below shows the new Price Guide Browse screen in Category Mode. As shown below, waving the mouse over any thumbnail image will automatically display a full size version of the picture! As before, clicking any piece or the Add to Holdings button will lead you automatically to the Add to Holdings screen (shown below). 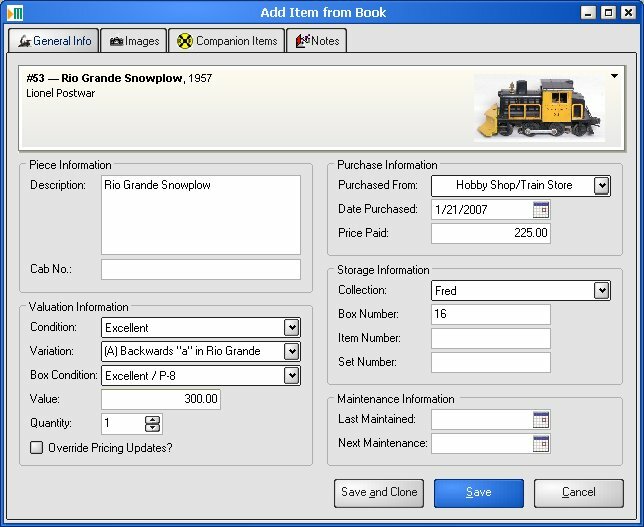 Speed Inventory was a feature included in the very first DOSAdd to Holdings version of the toy train inventory software developed by The REEF Development Company in 1990. We’re not sure why it ever disappeared, but we’re happy to bring back a new, improved version of the concept in TrainMinder. 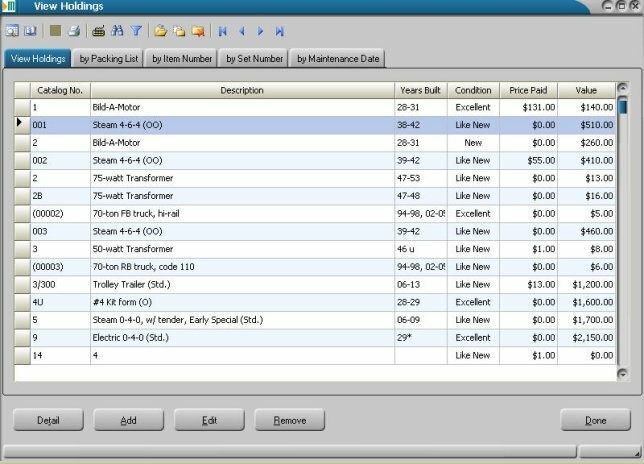 Using Speed Inventory, a user simply clicks a checkbox on the master list of train items, indicates the condition of the item (and a variation, if any), and clicks Save. That’s all there is to it! 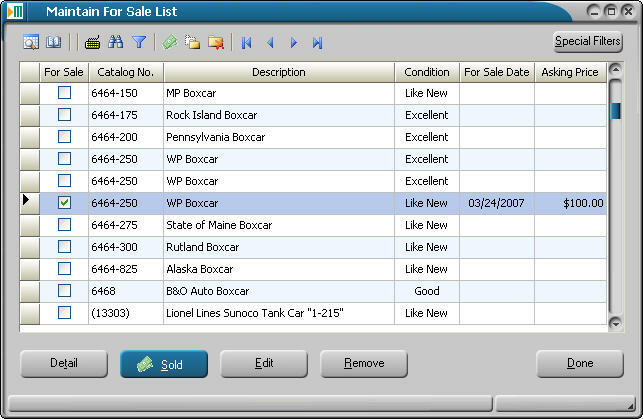 Users can use Speed Entry to develop an inventory list quickly and go back later to fill in details (e.g., add photos, notes, etc.) as time permits. 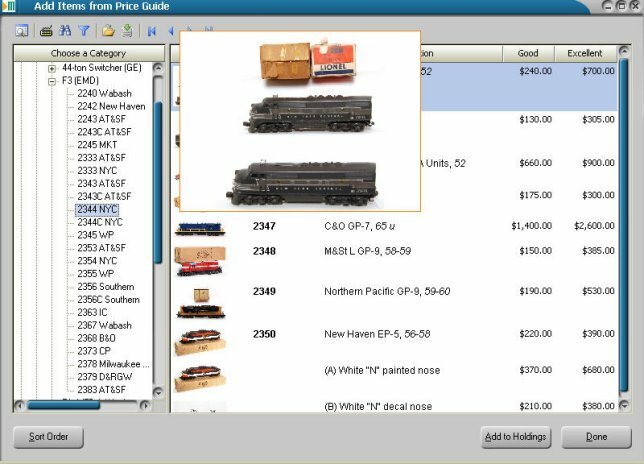 TrainMinder will let you easily keep a list of items in your collection that are for sale, and will help organized your sales and customer lists using the TrainMinder Address Book feature. TrainMinder’s Sold Listings can be edited too! TrainMinder has completely reengineered the way in which users can view the trains in their holdings. Related views are presented in a convenient tabbed format enabling you to switch quickly among different presentations of your collection. The new Holdings Views screen is shown below. 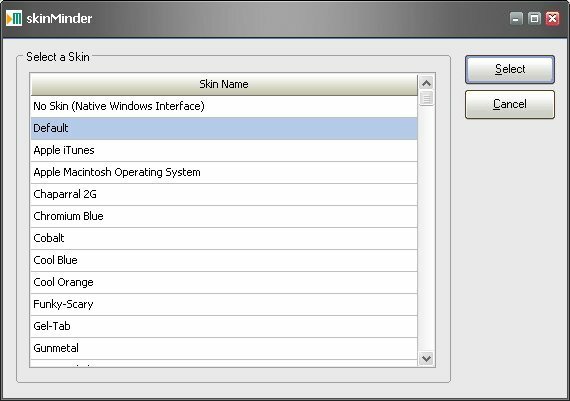 This screen presents all the most commonly used view screens all on one handy form. 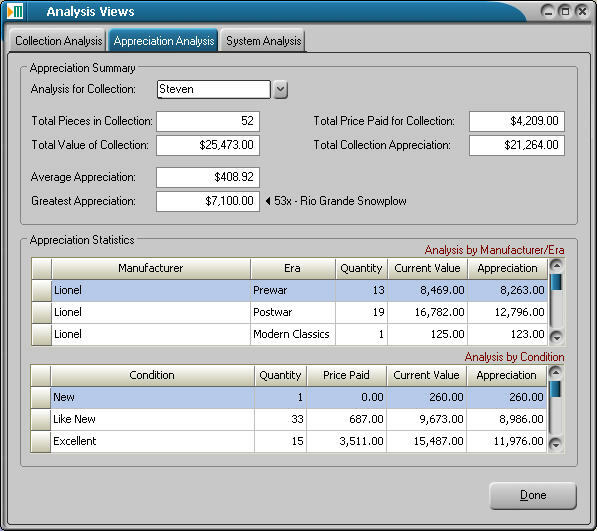 The Analysis View screen presents three different ways of analyzing your data and TrainMinder system. TrainMinder’s new screen layout conveniently hides information that isn’t likely to change when you enter it. 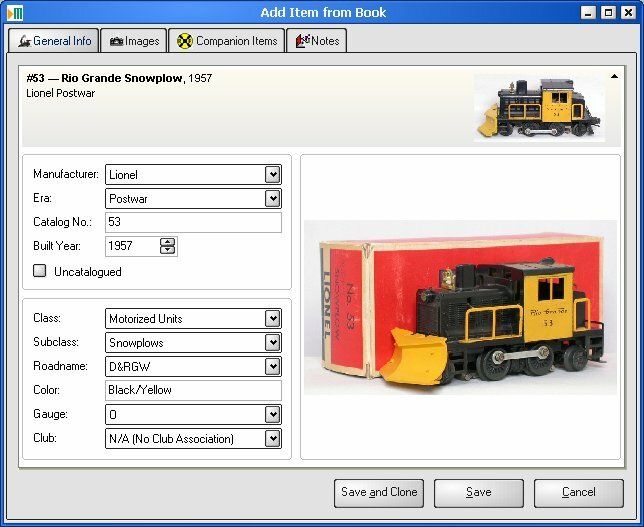 The new layout allows information that’s critical to most collectors — e.g., the box in which the item is packed — to be displayed all on one screen. Users can still access the base information about a piece by clicking the small arrow in the upper right hand corner of the screen. When this arrow is clicked, the Master Information drops down to display additional information about the item. Please note the new “Save and Clone” button on the entry screen. This button allows a number of similar items (e.g., all the cars in an 8-car passenger consist) to be entered quickly and easily without having to re-key the same information over and over. 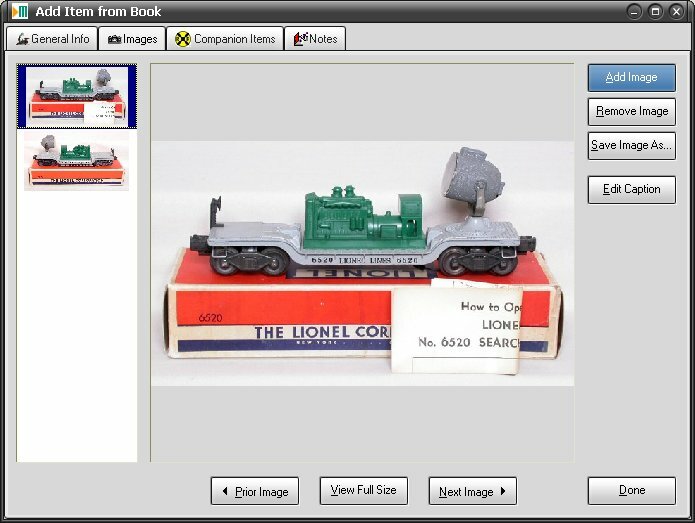 When adding your trains, TrainMinder also makes it a snap to add as many digital photographs as you’d like to document your collection. A browseable list of thumbnail images is displayed at all times to let you know which pictures have been added and which still remain. TrainMinder has 18 predefined views and reports that should handle most user’s reporting and display needs. Because different people have different tastes, however, we have built a view-generation wizard that we call ViewMinder. ViewMinder will guide you step-by-step through the process of designing and saving a customized view of your collection. 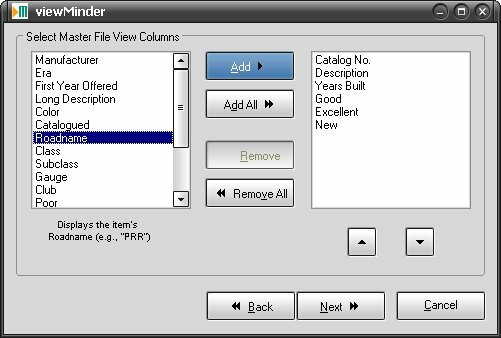 Users can use ViewMinder to specify the columns they’d like to see in a report, the order in which the report should be sorted, what items should be included/disincluded, and more. 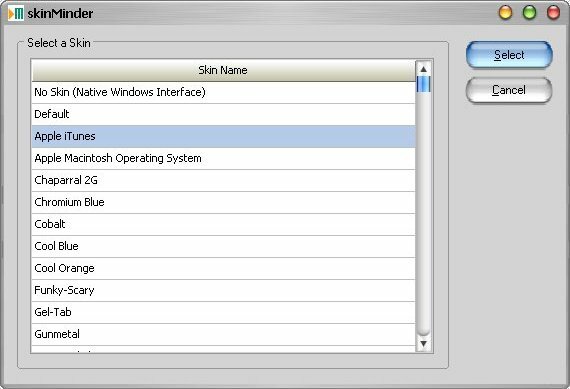 The screen below shows one of the wizard pages that lets users select the columns they wish to include in a view. The screen shots shown above were created using a few of the different “skins” that ship with TrainMinder. 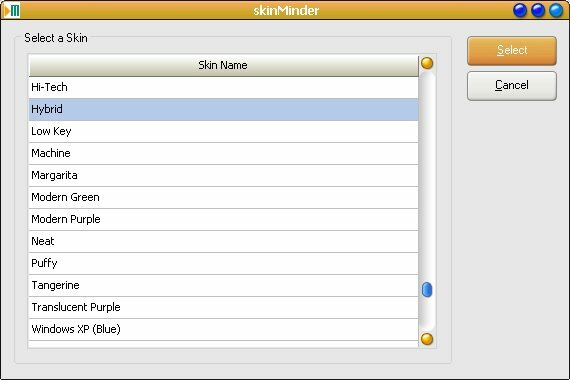 You can use the SkinMinder tool to browse through several different skins to customize the “look and feel” of your TrainMinder. We will continue to add other screen shots as we get closer to TrainMinder’s launch. Be sure to check back often, or simply sign up for our UpdateMinder Service and we’ll send you an email whenever there’s news to share.